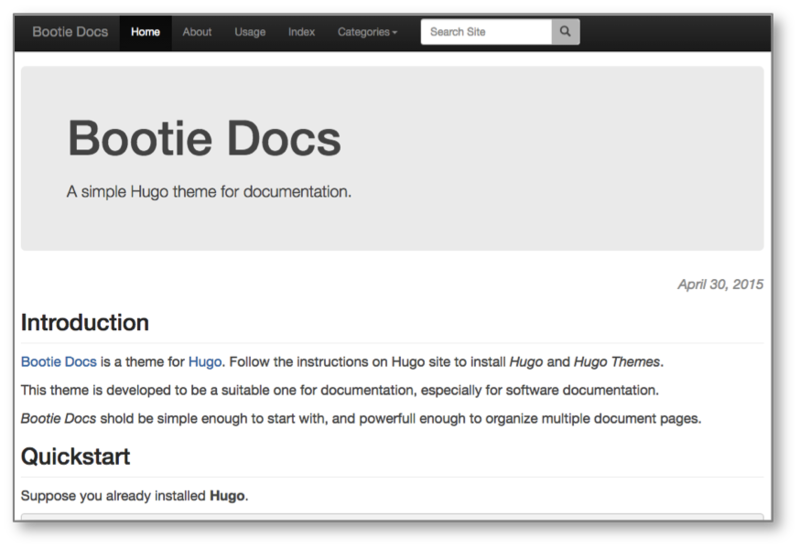 Bootie Docs is a simple hugo theme for documentation. The name “bootie” comes from Bootstrap CSS. You can see demo and full documentation at http://progrhyme.github.io/bootie-docs-demo/ . Then the content appears on top page. You can customize the menu items in the header navigation bar by configuring menu.main in your config.toml (or config.yaml) supported by Hugo’s Menu System. Nested menus are not supported. All other options and usages for Bootie Docs are described at the documentation site – http://progrhyme.github.io/bootie-docs-demo/ . Because Bootie Docs is developed for documentation, it lacks many blog-type facilities such as RSS feeds, pagination of posts and so on. Bootstrap v3.3.7 … Well-known CSS framework. jQuery v3.2.1 … Requried by Bootstrap. highlight.js v9.12.0 … For syntax highlighting. Copyright © 2015-2017 IKEDA Kiyoshi.